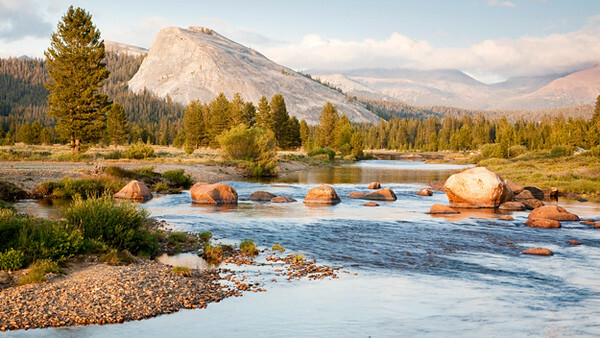 Been meaning to get up to Yosemite’s Tuolumne Meadows at peak season for a bit but just never got it done. So it was with great pleasure that Casse and I managed to get away on the first Friday afternoon of August 2009 as we took the three hour drive. The plan was to head out at noon. Well, that didn’t happen. We finally got going around 2pm. So the earliest that we could expect to arrive in Tuolumne Meadows was 5pm with plenty of time to find a decent scene to shoot before sunset. Well, that didn’t happen either. We got waylayed at the Valley View turnout in Yosemite Valley. The clouds were allowing bright light to peak through just as we arrived so we stopped, took a few shots and enjoyed seeing the scene change before our eyes. By the time we arrived at Tuolumne Meadows it was about 7pm, one hour before sunset. We walked around a while in search of a foreground and came upon this scene just across (North of) from the Visitor’s Center. It appears to be one of many turns in the Tuolomne River en route to the Hech Hetchy Reservoir and from there on to San Francisco to be used as part of their water supply. The clouds weren’t cooperating and neither was the light. And, we were too late for peak wildflower bloom. We played the hand we were dealt. This is my result. A two stop hard grad was used in this composition.